This month marks the 2oth anniversary of the reintroduction of wolves in Yellowstone. On March 22, 1995, after years of legal battles and logistical preparation, the gates of acclimation pens in Yellowstone National Park were opened and wolves – captured in Canada and transported to the United States – were once again part of the natural environment of northwest Wyoming. The wolves’ return set in motion a natural—and therefore uncontrolled—experiment that is still unfolding, and which offers biologists a rare opportunity to observe predator-prey relations among large mammals. Today, 95 wolves in 11 packs live in Yellowstone, hunting elk, deer, and bison. Yellowstone National Park officials are in preliminary discussions with CenturyLink about installing a $34 million fiber-optic line through neighboring Grand Teton National Park and into Yellowstone. That would dramatically improve mobile connectivity in certain developed areas for mobile devices. Yellowstone has had a cellphone and Wi-Fi plan since 2009, though coverage is spotty, and expansion of coverage through fiber optic wiring would make Yellowstone’s existing technological offerings more effective. QR codes in visitor booklets can be scanned to link to an online trip planner, and apps have been developed by private companies to alert users to nearby wildlife, though only where there is cell service. Mobile apps could help users more fully explore plant and animal life. Another what-should-be obvious benefit for expanded coverage in Yellowstone, is that better service and easier communication between the public, rangers, and first responders, is safer for everyone in an emergency. https://geyserkayak.com/wp-content/uploads/2018/02/KayakYellowstone.png 0 0 geyserkayak https://geyserkayak.com/wp-content/uploads/2018/02/KayakYellowstone.png geyserkayak2014-11-13 07:58:302018-03-12 17:05:04Better cell service? When we think of the Fourth of July, we think of barbecue and fireworks outside or, short of that, watching them on television. And while Yellowstone National Park does not fit the bill of traditional Fourth of July celebrations, it is nonetheless an excellent place to be, celebrating the United States of America. Yellowstone was created as a monument, set aside in the spirit of American heritage. It was a gift to the future, but in the present, it is a testament to the bounty of America’s environmental riches. Luckily, Yellowstone is ready to oblige anyone wanting to spend his or her Fourth in the Park. Yellowstone will be completely open. Road construction will cease between 5 p.m. on Thursday, July 3 and 7 a.m. Monday, July 7 to accommodate visitors. Of course, just because it’s a national holiday doesn’t mean that the rules will be slackened in Park boundaries. Visitors are still expected to stick to boardwalks, maintain safe distances between wildlife and maintain the speed limit while driving. Drivers are asked to exercise extra caution around the Fourth of July in Yellowstone, since the Park is expecting a high number of visitors. Fireworks are prohibited in Park boundaries, although many of the Park’s gateway communities will be holding ceremonies. Paddling the vast open water of Yellowstone Lake provides beautiful sunsets, abundant wildlife, and underwater geysers! Your guide will lead you around the shoreline to the West Thumb Geyser Basin where there are many geothermal features on land and under water we will explore from our kayaks, then return the way we came back to Grant Village without stopping, returning just before dark. Paddling away from the crowds in the west thumb of the lake, you learn how to safely and properly control your kayak so you are able to relax and take in all of the natural beauty of Yellowstone at sunset. We have both single and double kayaks available and no prior kayaking experience is required. Besides the geyser plains, Yellowstone’s Grand Canyon is the Park’s most splendorous attraction. The feature itself is entwined, not only in Yellowstone history, but national history as well. Famed landscape artist Thomas Moran established his reputation on a series of paintings made of the Canyon during the Hayden Geological Survey of 1871. These paintings, along with photographs of William Henry Jackson (a fellow artist on the trip) helped inspire Congress and President Ulysses S. Grant to preserve the Park for all time. Moran’s paintings still hang in the Smithsonian; one even hangs in the Oval Office. So, when you visit Yellowstone’s Grand Canyon, you’re not only visiting a geologic marvel, you’re visiting a tangible artifact of America’s development. This trail gives you a feel for Yellowstone’s backcountry. Hike through forest to the colorful waters and open meadows of the Lewis River Channel . Look for Eagles and Osprey fishing for trout in the shallow waters. River Otters and Beaver call this home too. Go back the way you came for a shorter 7-mile round trip, or continue on an 11-mile loop trial that takes you to Shoshone Lake and returns on the forested Dogshead Trail. A Montana staple since 1912, Wilcoxson’s is available all over the Park, although the best places to get it are at the Old Faithful Inn, and in the Grant Village and the Lake General Stores. All watercraft entering Yellowstone National Park must be inspected for aquatic invasive species. National Park Service staff conduct inspections seven days per week at the Bridge Bay and Grant Village boat ramps and at the South Entrance Ranger Station. Boats intended for use on Lewis Lake must be inspected at Grant Village or the South Entrance before launching. All motorized and non-motorized watercraft, including kayaks, canoes, paddleboards and float tubes, must also have a Yellowstone boat permit. The Park Service says Grand Teton National Park permits are no longer valid for boating in Yellowstone. Boat and float tube permits can be purchased at various parks facilities. Motorized boating is only allowed on Yellowstone and Lewis lakes, while non-motorized boating is allowed on most other park lakes. Wyoming Governor Matt Mead is calling on Interior Secretary Sally Jewell to act quickly and develop a rule removing federal protections for grizzly bears in and around Yellowstone National Park, arguing that the iconic predators are thriving in the region. Mead wrote this week in a one-page letter to Jewell that there is more than enough research and data to validate removing the Yellowstone area grizzlies from the list of plants and animals protected by the Endangered Species Act. And he referenced a letter Jewell had written to him in September 2013 in which she said a decision on the status of the Yellowstone population would be coming by early this year. “The recovery of grizzly bears in the Yellowstone Ecosystem is a conservation success story of our time,” Mead wrote. Mead pointed to a December report by the Interagency Grizzly Bear Study Team — established in 1973 to collaboratively monitor and manage bears in the Greater Yellowstone ecosystem — that found grizzlies will adapt and thrive despite the collapse of the whitebark pine trees in the region that serve as a key protein source for bears before they go into hibernation. The study team’s report was seen by some as a critical step forward to clearing the way for the bears to be removed from the endangered species list. Mead’s letter is the latest in the ongoing legal battle over the status of the bear, which was originally listed as threatened in 1975. Since that time, population numbers have more than doubled to 600 in the region that includes Yellowstone National Park and portions of Wyoming, Montana and Idaho. The growth in numbers has led to some fatal bear attacks on people in recent years; some Western state leaders have expressed a desire to allow grizzly hunts. But the Fish and Wildlife Service won’t be in a position to recommend for or against delisting the bear until it completes a detailed threats analysis this fall, said Chris Servheen, the service’s grizzly bear recovery coordinator in Missoula, Montana. That analysis, which he said has been ongoing since December, is required by the Endangered Species Act to be completed before any decision can be made whether to delist a federally listed species. https://geyserkayak.com/wp-content/uploads/2018/02/KayakYellowstone.png 0 0 geyserkayak https://geyserkayak.com/wp-content/uploads/2018/02/KayakYellowstone.png geyserkayak2014-05-28 08:13:572018-03-12 17:05:04Delist Yellowstone Grizzlies? Expanded Yellowstone Paddling Under Consideration in Congress. The River Paddling Protection Act, a bill that could expand Yellowstone paddling on certain lakes and rivers is under consideration in Congress, where it’s already been passed by one House committee. Senate Bill 2018, is sponsored by Rep. Cynthia Lummis (R-Wyo.) and would end 60-year-old regulations that prohibits paddling on certain lakes and rivers in Yellowstone National Park, Grand Teton National Park and the National Elk Refuge. The bill is supported by the nonpartisan American Whitewater group, which works nationally to implement and oversee paddling in an environmentally conscious manner. The bill, would not force the National Park Service to open huge areas for Yellowstone paddling, but would give them the ability to open areas on their own discretion. Yellowstone National Park Opens this Friday, April 18th. In Yellowstone National Park, one-ton bison bulls plow snow caves. Their massive, woolly heads dig to reach grass that will sustain them till green up comes to this high country months from now. Half-ton cows and calves spend their winter days in the same routine. Their movement is determined by Mother Nature. They go where they can eat grass. The weather is a wild card. If big snowstorms bury the bison winter range, or the snow becomes encrusted with ice that keeps bison from their food, more will migrate and fewer will return in Spring. There is a wealth of unique and fascinating treasures hidden in the lodgepole pine forests inside Yellowstone National Park. A few steps away from any main trail one can spot numerous animal tracks in the fresh snow including pine marten, snowshoe hare, red squirrel, fox and deer mice tracks. Many small woodland animals don’t hibernate, but thrive under the snow in their own subnivean world. Under the snow is an active world of pocket gophers, mice and voles. There are tunnels connected to the trees, which is why foxes are so prevalent in that area near town. Foxes can pinpoint the critters through the snow. The lodgepole pine makes up 80 percent of Yellowstone’s tree cover. Lodgepole have no taproot, working well here because the soil is typically only six to 12 inches deep. The tree is also a sun-tolerant tree, so when areas open up after wildfire, the tree has a large areas with a lot of sun to colonize. Other Yellowstone trees such as firs and spruce can’t tolerate the sun nearly as well, making lodgepole the dominant tree in Yellowstone, at least for now. Trees produce different cones due to genetic variability. The one basic, normal pine cone that all trees exhibit on a two-year cycle which you see on trees all the time. The other kind, like found on Yellowstone’s lodgepoles, never open up and stay on the tree indefinitely and won’t open scales unless they experience temperatures of 113 degrees Fahrenheit. These are called serotinous cones. The South Entrance to Yellowstone National Park opened Friday and now nearly all park roads are open to auto traffic for the season. Federal budget cuts had threatened to delay the opening by up to two weeks. The budget cuts took effect March 1. 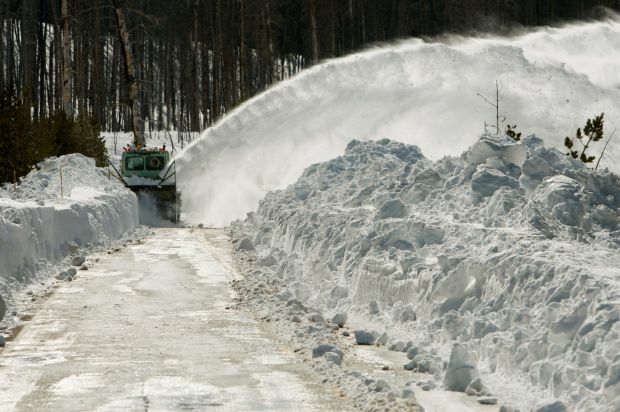 Yellowstone officials delayed plowing to save money. The decision worried many business owners, including Geyser Kayak Tours. Businesses and the towns of Jackson and Cody, Wyoming, raised $171,000 to hire Wyoming Department of Transportation crews to help with plowing. The effort enabled all park entrances to open on time. Only the route over Dunraven Pass remains to be plowed. That section of road is scheduled to open May 24.